After many years of freelance web development work, not only building basic sites, but managing online communities and building complex custom ecommerce solutions, I have partnered with Sunrise Marketing. 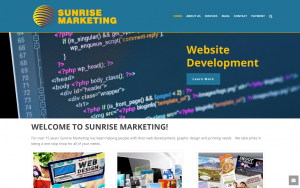 All of my new web development work will be done through Sunrise Marketing. You shouldn’t notice any major difference in communicating with me, level of work, or pricing. I now have a team behind me of graphic designers, printing services, and marketing professionals which can work hand in hand with web development needs. This means more time for me to devote to my clients and on personal and professional development. To learn more about Sunrise Marketing, visit www.Sunrise-Marketing.com. If you are interested in any of the services offered from Sunrise Marketing, including web development, graphic design and printing services, please contact us.